Until recently, the HERO5 Black was GoPro’s flagship action camera. While it’s recently been superseded by the HERO6 model, the HERO5 Black still has plenty to offer photographers seeking a virtually indestructible camera that can be taken anywhere. 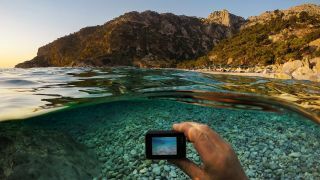 Built around a 1/2.3in sensor, the GoPro HERO5 Black can capture 12MP stills both JPEG and Raw formats. We love the fact that you can capture Raw files from this camera, as this allows for more editing potential when converted using software such as Adobe Lightroom. Furthermore, despite the high resolution of the sensor, the 30fps burst rate means you’re sure to never miss the moment, whether you're shooting sports or something else. As with the stills features, video specs for the GoPro HERO5 Black are also impressive. It's capability of shooting 4K up to 30fps, 2K at 60fps or Full HD at a super-speedy 120fps. This fast Full HD mode can then be used to create dramatic slow-motion sequences, which again is perfectly suited to sports or even wildlife action. We also like that the footage is stabilised, which is a must with an action camera that will most likely be moving while recording, although there’s no touch zoom option unlike on the newer HERO6. Audio for the video is provided by no less than three microphones and there's a special Wind feature to cut down unwanted noise when the camera is in blowy environments, although a 3.5mm port does gives you the option for an external mic. The HERO5 Black is waterproof to 10 metres and is powered by a removable 1220mAh battery, which means you can pack extras if you’re heading out on a long day of adventuring. Overall, although the HERO5 Black is no longer the very best GoPro you can buy, it should certainly be more than enough action camera for all but the most demanding photographer. Better yet, because it’s now a little older, prices have fallen, making it a cracking bargain too.